Q: What’s the most notable aspect of Oregon’s high desert? Phillip Elden: One of the most aesthetically appealing aspects of Oregon is the wide variety of landscapes. On the state’s western side, the Cascade Mountains provide a visually arresting experience. The area around the Cascade Mountains contains a series of rugged beaches with lush, green trees. 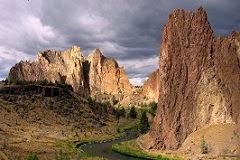 Q: Where is the desert region of Oregon located? Phillip Elden: The desert region is located in the southeastern portion of Oregon. The look of the landscape shifts dramatically once you arrive there. If a traveler takes the scenic route from Portland past Mt. Hood, Mt. Hood’s west side is green and lush, but soon after there’s a massive change. As you move toward the east, the land suddenly flattens out, dries up and turns a rusty brown. Even for Oregon residents who should be used to this shift, it still seems impossible that these different regions would be found right next to each other. Q: How does the climate of the high desert compare to other deserts? Phillip Elden: Despite its moniker, most of Oregon’s high desert isn’t truly a desert. In fact, the weather isn’t nearly as hot or humid as African or Asian deserts. The more accurate terminology would be either steppe or scrubland. Q: What’s the highest point in the desert? Phillip Elden: At 9,733 feet, the summit of Steens Mountain remains the highest elevation in the entire desert. This mountain was formed centuries ago, along with the plate tectonics that mark the region. Q: What’s the history of Steens Mountain? Phillip Elden: Approximately 16 million years ago, lava from volcanic eruptions blanketed nearly half of Oregon’s surface area. At this time, the Earth’s crust started to stretch. More volcanic activity occurred for millions of years, followed by numerous ice ages that formed the sizable lakes located in the desert.